If you’re going to splurge on a luxury trip, it might as well be Paris. After all, few other cities in the world do lavish hotel rooms, extravagant boutiques and refined brasseries the way Paris does. Paris was ruled by its five official palaces for decades; but many new luxury hotels opened in the past ten years, effectively throwing balance out the window with their modern approach. Now, the five original “grandes dames” are all undergoing extensive, multi-hundred-million euro renovations in order to keep up with the trends (and update their historic amenities). How do you choose the authentic from the overpriced? 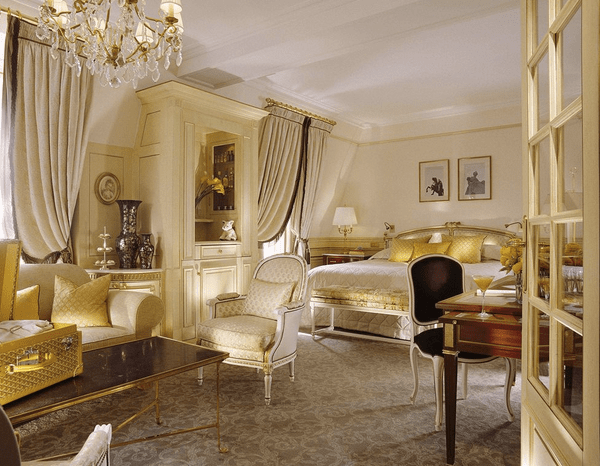 Here are the top 10 luxury hotels in Paris for a memorable, one-of-a-kind experience in the City of Lights. Located on the prestigious Avenue Montaigne in the 8th arrondissement, Hotel Plaza Athénée opened its doors in 1913. The hotel, which most people will recognize by its distinct red geraniums and awnings, prides itself in being the most Parisian of all hotels. It’s also a one-stop-shop kind of hotel, with five on-site restaurants (one of which is overlooked by renowned Alain Ducasse), a Harry Winston boutique and a Dior Institute. Perhaps the ultimate palace in Paris, Le Ritz is tucked away in Place Vendôme and neighboured by shops like Rolex and Louis Vuitton – a natural setting for the notoriously lavish but elegant brand. More than just a pretty facade, this hotel has plenty of stories to tell; it was Coco Chanel’s residence for several years, and it was used as the headquarters of the Luftwaffe during World War II. It’s also where Lady Diana dined before her tragic car crash. Not to be outdone, Le Ritz has been closed for the past three years in order to make major “behind the scenes” refurbishments; rumour has it that the hotel will be equipped with the latest technologies and top of the line bathrooms. And when Ritz says top of the line, they mean it. 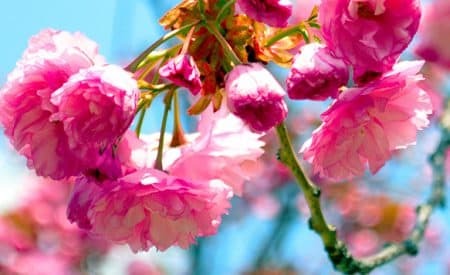 Reservations will open in June. 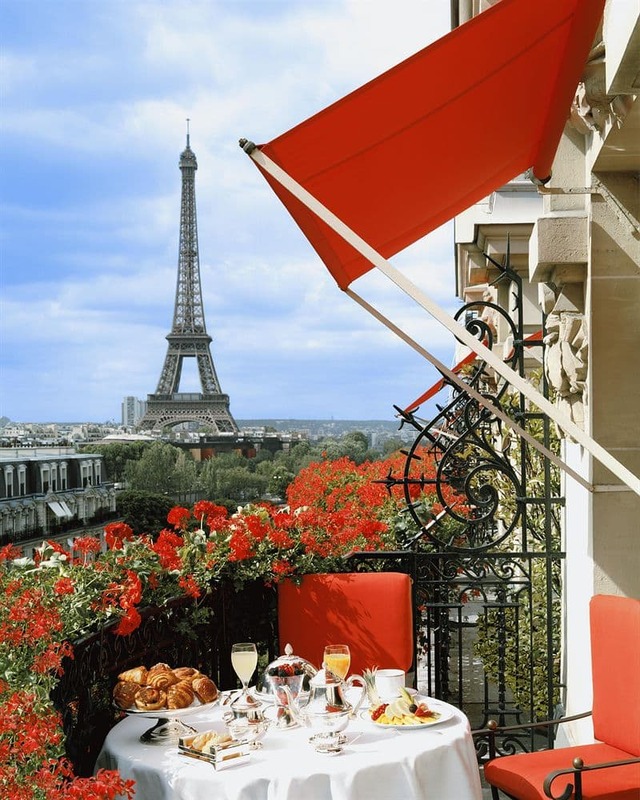 Let’s just go ahead and state it right away: Shangri-La Paris has the best views of the Eiffel Tower, period. While the hotel offers the same luxurious amenities as other 5* properties (high-thread count sheets, fragrant toiletries, impeccable service, respected restaurants), the view from its guestrooms really obliterate the competition. Its location across the Seine graces guests with unobstructed views of the iron lady, in the morning when she awakes, and at night when she sparkles. And despite how Parisians feel about it, few things swell the heart of a traveller as much as the sight of the illuminated Eiffel Tower does. Mandarin Oriental Paris is where luxury-seeking European couples mingle with wealthy shoppers from North America and the Far East – the hotel’s location on fashionable Faubourg Saint-Honoré makes for a nice excuse to go out and shop French haute couture like no one’s watching. And true to the Oriental tradition, this property allows guests to be pampered at the world-class, exclusive spa, one of the largest in Paris. Good to know: the hotel features outstandingly spacious guestrooms, a rarity in the compact City of Lights. As one of the few original “grandes dames” that is not currently closed for renovations, Le Meurice has gained a lot of attention in the past year. The Louis XVI style, while omnipresent throughout the property, harmoniously competes with contemporary-chic Philippe Starck touches for a unique, eye-catching look. Its location is perhaps the strongest of its selling points, just steps outside The Louvre; something that guests like Salvador Dali, Ginger Rogers, Elizabeth Taylor and most recently Queen Bee have been quick to take advantage of. Another sticker in Le Meurice’s book is its wraparound terrace, which offers splendid 360-degree views of Paris. Created by merging seven classic Haussmann-style buildings along the Champs-Élysées, Hôtel Fouquet’s Barrière was already promised a brilliant future. 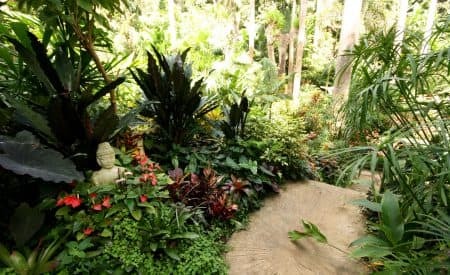 A certified Dignified Luxury property, the hotel chose not to overlook sustainability in the name of luxury, but does not sacrifice comfort or design in the process. With its round-the-clock butler service and its state of the art technological equipment, Hôtel Fouquet’s Barrière expertly mixes tradition and modernity in its well-appointed guestrooms – earning the hotel the enviable title of palace parisien in the process. 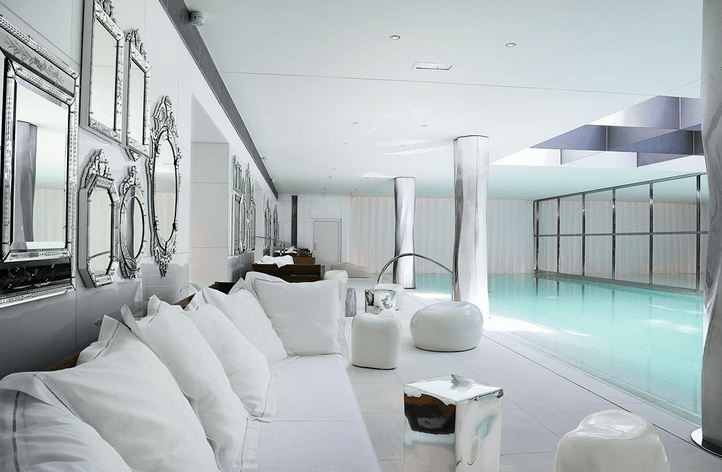 If you are going to Paris and want to experience luxury in a novel way, head to Le Royal Monceau Raffles. Not only is the location a nice change (in an upmarket but residential area just off Champs-Élysées), but the hotel features a 99-seat cinema, a Clarins-certified spa, an art gallery with rotating exhibitions, and, for the athletic types, the largest swimming pool in Paris. Gourmet travellers will also appreciate Il Carpaccio, the hotel’s Michelin-starred eatery (with desserts concocted by none other than famed pâtissier Pierre Hermé). As the most recently opened of the luxury hotels in Paris, The Peninsula had high expectations to meet. The small chain, which is firmly anchored in the 21st century, offers decidedly modern decor and the best tech-related amenities of this list (including room service straight from the bedside tablet and built-in charging outlets with international plugs). It should also be known that The Peninsula gives the Shangri-La a run for its money with its rooftop terrace, coming in close second place for best views of the Eiffel Tower. 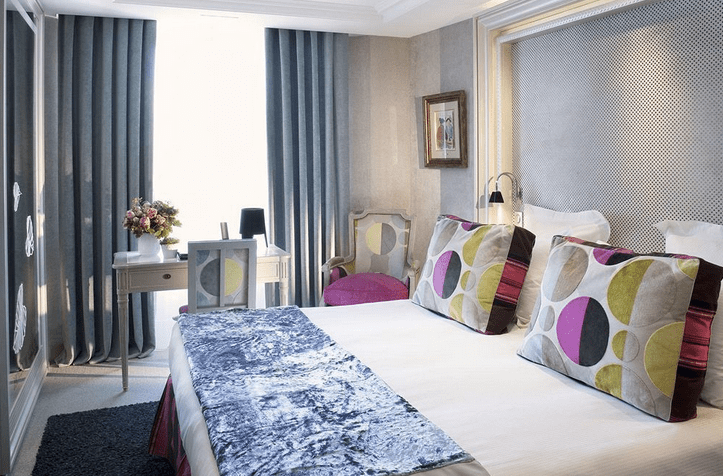 Because not everyone can afford a €1000+/night hotel room, Madison Hotel is one of the best options in Paris for visitors longing for style and luxury, minus the hefty check. Nestled in a quiet street in intellectual and hip Saint-Germain-des-Prés, the townhouse boutique hotel gives visitors the opportunity to experience Paris like a local. The bright, fashionable guestrooms, despite being on the small side, are like a breath of fresh air, as is the Bordeaux selection at the stylish wine bar on the ground floor. If the purpose of your Parisian escapade is to visit as many museums as possible, then Le Cinq Codet is your best bet. Located in the square formed by Musée d’Orsay (with the Louvre being across the Seine), Musée de l’Armée-Les Invalides, Musée du Quai Branly and Musée Rodin, this hotel features a full-service spa, a fitness center, and a bar/lounge to relax after a long day of museum hopping. Morning sleepers will appreciate the 12 o’clock checkout time at no extra cost. 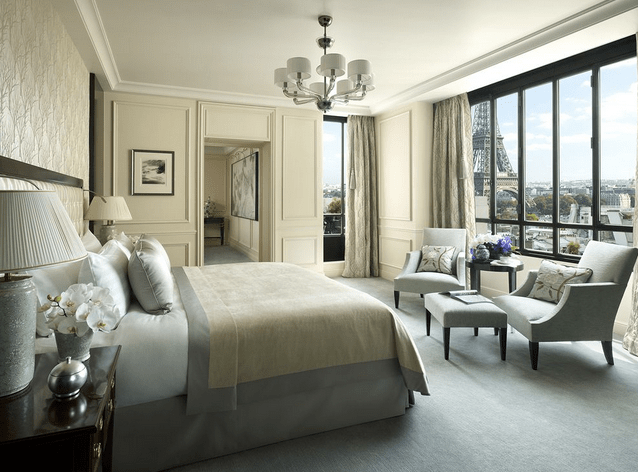 What is your favourite luxury hotel in Paris? Next What's popular in adventure travel?